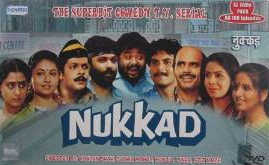 Episode #6 of Hindi TV Serial Nukkad talks about a theft happened at Nukkad. The episode is focused on Radha and the theft in which she was a suspect. But if you watch carefully it takes a satirical look at a lot of things happening around us, and, all them are a kind of theft. For example, see the introductory scene between Raja and Chaurasia. Those who have watched the TV Serial knows that Raja have a habit (or rather we say, nature) to pretend having good connections in almost every field, and try impressing the people. In reality however we were unable to find him having any such links. He, by faking his connection with an officer in Municipality, talks about some certificate (needed by the shop) to Chaurasia. During the conversation he smartly brings a cigarette from Chaurasia and smokes it! Isn’t it a kind of “theft”? Chaurasia also know it. The scene of the bagger is also tell the same story. Dukhiya (the bagger) faking is physical disabilities, tries making the people sentimental and give him some money. Isn’t it a kind of “theft”? He and his buddy then tried getting money from someone to have a cup of tea. And when they are unable to find it, they decide to lure Guru. They use the worlds “chalo, Guru ko Topi Pehnate hai“. Isn’t it a kind of “theft”? The conversation between Guru, Raja, Dukhiya and others explores more such incidents. They were reading news of someone who did theft of electricity power! Actually by bribing someone in electricity department some wealthy businessman was using a direct electricity connection without proper “meter”. So he can use as much as power he need, but need not to pay the bill! Isn’t it a kind of “theft”? The news about wealthy businessmen faking the shortage of some important goods (including food products, grains, etc.) creates artificial demand in the market and earn from the same. Isn’t it a kind of “theft”? Their conversation takes satirical look at possibilities of having ration on “free air for breathing”! The street worker was however wondering that why people are not doing “theft” of garbage?! It tells us a lot about the requirement of “cleanliness” and our awareness about the same! This episode also focuses on the love triangle been Hari-Radha-Madhu. Radha (a maid) loves Hari. Hari (the cycle repairing shop runner) however loves a college girl named Madhu. Radha’s emotions for Hari and Madhu are explored pretty well in the episode. The conversation between Radha and one of the other college going girl (at whose place Radha was doing work) is quite realistic. See how innocently Radha asks about the “stuff” happened at college, the number of Sarees the girl possess and much more. It explores Radha’s curiosity and jealousy as well as the gap between Rich and Poor. But the main “theft” on which the episode is focuses is yet to come. We however will not spill the beans about the same, so you can enjoy it while actually watch the episode. The positive factors of the episode includes the realistic dialogs. They are simple and effective. The script writer made sure to stick to the reality and it pays off. While watching the episode we often think, why such realistic TV serials are rare to find these days! The set of Nukkad is quite congested (and thus look even more realistic). The power packed performances by almost everyone (all of them are fantastic actors) makes the episode – good to go for – for sure. The portrayal of happenings around the world (the episode suggests that the rate of 1 USD = 10 INR was effective those days, for example) via witty dialogs, leaves impact. The technology was not so advanced those days so you may find the video quality quite dull while watch the DVD. Also the second half is not as good as the first half of the episode. Especially, you expect something different as the reality of “the theft” (we cannot tell more here). Overall it is really a nice episode to watch. The new generation who didn’t got a chance to watch this TV serial when it was originally aired, shouldn’t miss the chance to watch it on DVD. It will definitely help them understand why those days are considered as “golden days” not only for DoorDarshan (the only TV Network in India those days) but for TV Network in India.